The murder of Dr. Tiller inspired Zach Mason (Softpieces) to bring together experimental noise/sound artists to raise for issues related to reproductive rights. Zach asked us to perform and contribute to a compilation CD-R. Unfortunately the show is schedule during our visit in the UK. We will contribute the live recording of our performance of “Irigaray” at Queering Sound 09. Thanks to Steve Sanford for recording it. 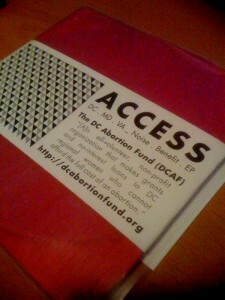 All the funds generated from the CD-R sales will go to the DC Abortion Fund.